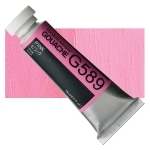 Holbein's opaque matte gouache is Japan's foremost designers' color medium. These paints deliver a brilliant, rich matte finish using naturally opaque pigments - no opaquing agents added. This creates vibrant, exciting color that won't muddy when mixed. Rhodamine B is a staining violet dye that has fluorescent properties. It is extremely soluble in both water and alcohol. In art materials it is laked as a pigment. Rhodamine B, like all fluorescent dyes, is not considered to be lightfast. It is recommended for permanent works of art only if they can be adequately protected from exposure to ultraviolet light. The fluorescent dye Rhodamine B is toxic, and its use is banned in food, textiles, and cosmetics. It is harmful if swallowed, inhaled, or absorbed through the skin. It has been shown to be carcinogenic in rats when injected subcutaneously, producing local sarcomas. However, when it is laked as a pigment it can be biologically inactive and hence non-toxic. With proper preparation, the pigment Rhodamine B Lake is considered harmless, even if ingested. Rhodamine B, discovered in 1887, is used as a staining fluorescent dye in the biological sciences, for microscopy. It is also used as a laser dye. Because of its low cost, high tinting strength, solubility in water and alcohol, and relative stability for a fluorescent, it has sometimes been used as a food colorant, even though its use in food and cosmetics has been banned in most countries for many years. There have been several highly publicized recalls of food and cosmetic products contaminated with Rhodamine B.